"I never really liked traditional monopods. What I have found to be very useful is what some people call a string monopod. Here's how to make one version of this device.You need a 1/4x20 eyebolt, two 1/4x20 nuts, and a length of clothes line (or any line that doesn't stretch). Put both nuts on the eyebolt, and then carefully attach the eyebolt to the camera's tripod mount. If you over tighten the eyebolt you can damage the camera's bottom plate. 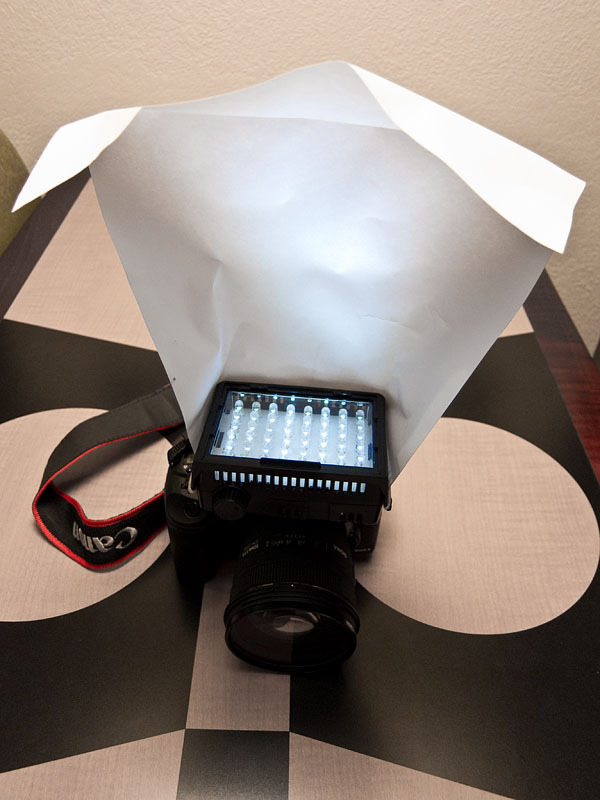 Gently tighten one of the nuts against the camera's bottom plate, and then tighten the other nut against the first. The nuts will prevent you from over tightening the eyebolt when you re-attach the eyebolt later. Now you tie the rope to the eyebolt. To use the string monopod attach it to the camera, drop the rope on the floor, step on it, and then pull up to put tension on the rope. I've had very good luck with this. For last year's Solo Photo Book Month project, I shot on the streets of Manhattan with a handheld Yashica Mat 124G and a string monopod. I was able to use shutter speeds as low as 1/30 second. So, if you're not the trekking pole type, the string monopod might be just the solution for you on the trail. Thanks Brian! If you have a great outdoor tip, or favorite piece of equipment, send it along to me. I'll feature reader submitted tips on a regular basis. The 5th generation iPod nano has terrific new functions such as an intelligent FM radio receiver and a video camera that can record hours of SD movie capture. One challenge that I encountered while recording video, however, was finding an easy way to steady the camera for scenes where the subjects were stationary, such as during a speech or a musical recital. By modifying two parts of the packaging for the nano, you can quickly create a stand that works on any horizontal surface, allowing you to record super-steady movies. When not in use, the stand folds up so it's nearly as compact as the nano itself. All you have to do is drill a hole in the flexible holder that your iPod ships in. I simply put the nano in the holder, marked on the clear plastic where the camera lens is with a Sharpie, removed the nano, drilled the hole, then reattached the iPod. When you're ready to record, stand it up in the open lid. You'll find that you have a number of adjustments that you can make just by moving the iPod around in the open lid. This allows you to get just the right recording angle. When you're done recording, place the holder in the lid and secure with a rubber band. You can leave the nano in the holder if you know you're going to record more video soon, or put it back in its regular case. A couple of additional tips: 1) drill a largish hole because the microphone is next to the lens and you'll get better audio pickup. 2) if you drill a second hole on the side of your stand, you can plug in the headphones also and use the stand for hands-free movie viewing. One thing that I always mention to people who purchase Apple devices is to hang on to the packaging. There are always components that they can repurpose later for accessories such as this DIY nano stand. Editor's Note -- Recently I was corresponding with TDS member Brian F Wilkie about a project he was working on. Brian had figured out how to create a unique type of photo album where he output pages with snapshots printed on them, then bound these pages together in a binder. I loved this idea and asked Brian to write a short article for us, which he kindly did. So, in his own words, here's how Brian Wilkie creates his unique output, complete with Lightroom templates so you can do the same. Thanks Brian! Using Lightroom 2.4, a Canon Pixma Pro 9000 printer, and Red River Paper's excellent Premium Gloss DUO 8.5" by 11" letter-sized stock, I'm able toÂ create a handsome looseleaf bound album quickly, and fairly easily. In Lightroom, I start with aÂ grid filter which gathers all images taken in aÂ particular year with a rating of 1 star or above. The choice of rating will vary with how hard you are on yourself and whether you want to include family snapshots as well as fine art images.Â Select all of the pictures (command A), then create a collection called Album 20XX (filling in the appropriate year). Now, you can use delete to remove any images which are repetitive, virtual copies you made for different print sizes, or black and white versions. By the end of the process you will have a good idea of how big a printing task you have undertaken. You can download a pair of print templates that make good use of the real estate on a US letter page, as long as you have a printer that can handle borderless printing. These templates provide 4 prints up at 5.5" inches by 3.67" inches on a page. I use the "rotate to fit" option so that portrait mode images are printed as large as possible, although this means that on some pages viewers will need to turn the binder on its side to see the pictures oriented correctly. I also enable Page Number under Page Options to help keep track during printing, and the Identity Plate option for my Logo. Finally, the Photo Info option is enabled using Capture Exposure Date as a template. Be careful not to be too wordy in captions or the text will wrap around andÂ the photo size may be restricted. Printing is done using the appropriate ICC profile downloaded from Red River Paper with Print Sharpening set to "High" and Media type to "Glossy". The printing itself is completed in two passes. First, the User Template "4up letter+data Odd" is selected, then Print is clicked. At this point, settings options become printer and computer operating system specific. As I mentioned before, I use a Canon Pro9000 on a Mac running OS 10.5. In the print dialog box under Paper Handling, I select Pages to Print - Odd Only. I also select Page Order - Normal. Under Quality and Media I select Media Type - Glossy Photo Paper and Print Quality - High. Under Borderless Printing, I select Amount of Extension - Min. 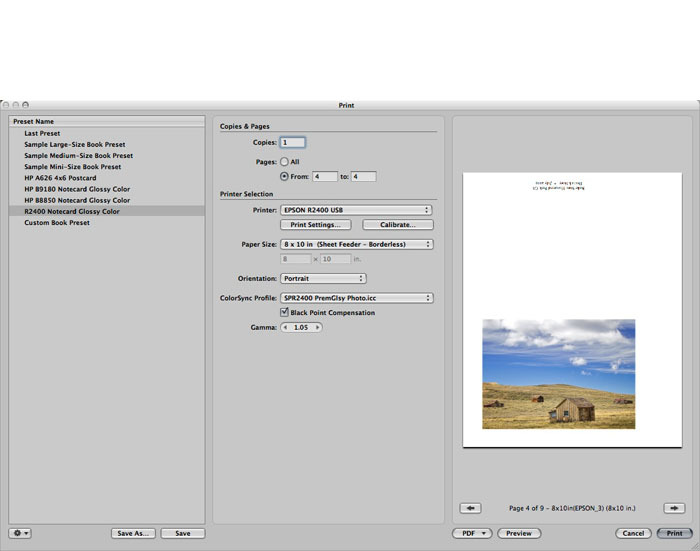 This allows the page number to be visible on the final print since Lightroom puts this in the extreme lower right corner of the page. After the first pass, carefully flip over the set of odd pages and put them into the paper feed. The top sheet should now be the back side of page one, but careful experimentation is called for here. Select the user template "4up letter+data Even" and click Print. Now under Paper Handling changeÂ to Pages to Print - Even Only. All you need now is a good quality 3-hole punch. Remember, this is heavy paper stock. Then put the pages in to a quality 3-hole binder.Â I use a nice leather one from the local office supply store. The end result is a good looking, well printed, and durable album. By my calculation the cost is around 28Â¢ per image, less if you shop around for discountedÂ Canon ink. Of all the cameras I had in the past, my favorites were made by Contax. The first model I bought (when I had absolutely no money) was the Contax 139 with the Zeiss 50mm f/1.7. I later added the Zeiss 35mm f/2.8 and 135mm f/2.8 lenses. It was thrilling every time I picked up the camera. Over the years, I had other favorite bodies too, including the 167MT and RX. After I made the transition to digital photography, I sold much of my film equipment. I did keep, however, my absolute favorites. I wasn't quite sure why at the time; I just didn't want to part with everything from the past. So I still have the Contax RX body, 5 prime lenses, and the pocketable Contax T. I also kept the Hasselblad 500C with both the 80mm and 150mm lenses. The Transamerica building in San Francisco. Shot with an Olympus E-P1 with a Zeiss Distagon 35mm lens mounted. Photo by Derrick Story. Click to enlarge image. See more images with this rig on the TDS Flickr page. I didn't use any of this equipment for a long time. Then, when I started shooting with the retro-looking Olympus PEN E-P1 camera, I got a hankering to try the collection of Zeiss lenses on that body using the Rayqual Micro Four Thirds adapter for Contax M lenses. 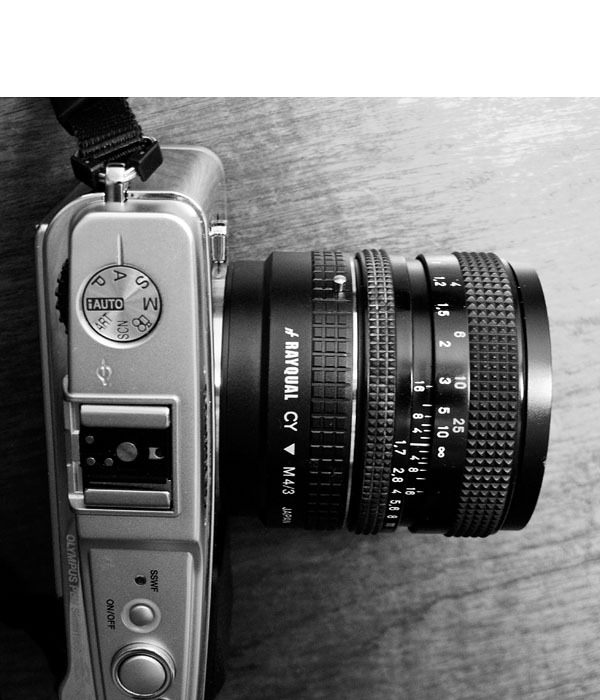 I wrote about the experiment in the article Zeiss Lens on Olympus E-P1? Oh Yeah!. There are some good reader comments there too. When I wrote the article, I promised to publish shots using a Zeiss lens on the E-P1. My opportunity appeared this week when I had meetings in San Francisco. I packed the Olympus with the 35mm Zeiss Distagon lens, and clicked photos as I walked from one appointment to the next. You can look at the set of images on the TDS Flickr page. These are Raw files processed in Adobe Camera Raw. I had a great time shooting these images. I was manually focusing with the well-damped focusing ring in the Zeiss Distagon. I set the E-P1 in Aperture Priority mode and used the click-stop aperture ring on the Zeiss lens to set the f/stop. In all honesty, I felt more like an artist than a snapper using this rig. Now that I have the bug, I'm going to see about mounting these lenses on my Canon 5D Mark II. 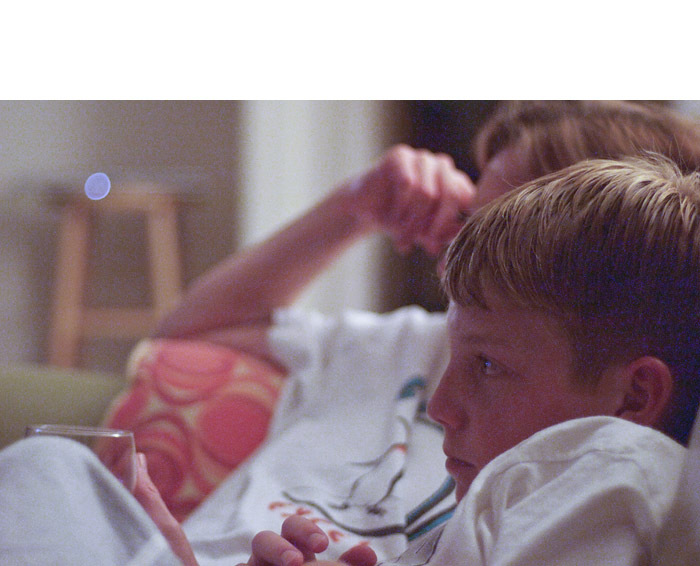 Since it's a full frame sensor, everything should look as it did when they were mounted on my Contax bodies. I'll keep you posted. In the meantime, I'm going to continue to shoot with the Olympus E-P1 and my collection of Zeiss glass. You can make photo art notecards that won't be just good; they'll be professional too. And I'll show you how. 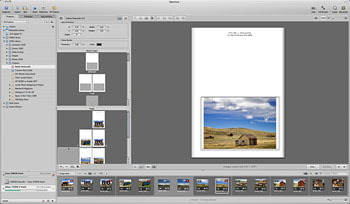 This workflow uses Aperture software, an Epson printer, and Red River paper. It's fast, efficient, and archival. Once you're set up, you can print just a few cards whenever you need them, or for larger runs, spend a rainy afternoon creating entire sets of cards to sell or give as presents. Of course you can make substitutions to this workflow, but if you have the tools listed here, that's where I'd start. Quality ink jet printer. I'm using the Epson R2400 for this project. Red River notecard stock. For glossy surface, use 60lb. Pecos River Gloss (#8451) and for matt surface, I recommend Premium Matte C2S (#1567). Both stocks are 7" x 10" and fold down to a 7" x 5" note card. Photo software. 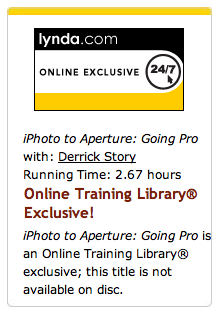 I highly recommend Aperture 2 (or later) for this project. Why? Because I create the notecards using Aperture's book making tool. This allows me to design everything precisely as I like, and then it remembers all my settings so I can revisit the project at any time and print more cards that look *exactly* like the original set. Envelopes. You can use what ever you want here, I found Darice 5" x 7" envelopes at the craft store for about 10 cents each. Page Size - Width: 7", Height: 10", Margins - Top: 5.5", Bottom: 0.5", Inside: 0.5", Outside: 0.5". Then click OK. The Aperture layout tool. It was originally designed for books, but it's great for notecards too. Click to enlarge image. Your selected images will be added to the new project you just created, and you'll be greeted with the layout tool interface. Open up Master Pages (Gear icon > Show Master Pages), and click on the 1-up template. Go back to the Gear icon and choose "Show Layout Options." You'll see new dialog boxes appear above the Master pages that allow you to specify settings. X: 0.50, Y: 0.65, Width: 6.00", Height 4.00", Angle: 0Â°. You can adjust these settings later to your particular tastes, but this will get you started. 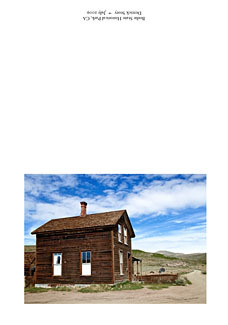 Then right-click on the photo placeholder and choose from the popup menu: Photo Box Alignment > Scale to Fit Centered. You've now set up your template. You can add text by choosing Gear > Add > Text box. Type your text in it, then click on the "T" at the top of the interface to format it. You'll probably have to rotate it 180Â° if you want it to print correctly on the back of the card. Now go to the Pages box (below Master Pages) click on the 1-Up thumbnail, and drag a photo from the Filmstrip to the empty placeholder in the big browser window. To make sure your Master Page settings are honored, I recommend going back to the Gear icon and choosing: Reapply Master. You've now designed your first notecard. You can add more notecards by going to the + icon and selecting "Add New Page" from its popup menu. I created eight of these 1-Up pages for my Bodie notecard set. 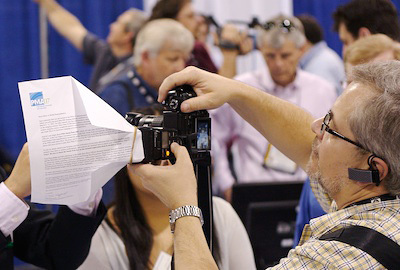 As with any big printing project, make sure your screen is calibrated and your printer is full of ink and ready to go. I choose the R2400 for this project because it handles card stock easily, plus it seems to like Red River paper. To avoid paper feed problems however, I only load one sheet at a time for notecards. For notecards using the 60lb. Pecos River Gloss, use the following settings in Aperture. The Aperture Print Dialog. You can save your settings as presets so it's easy to print the job later on. Click to enlarge image. Select the notecard you want to print, then click the "Print" button in the lower right corner of the Aperture interface. 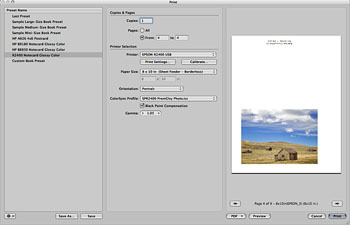 A dialog box will appear with "Custom Book Preset" selected in the left hand column. Make a test printing one card, so I recommend that you use the "From X to X" setting instead of Print All. Next, select your printer from the popup menu. And for paper size, I've had great luck with 8" x 10" sheet fed (even though the paper is really 7" x 10"). I set the ColorSync profile for Epson glossy paper (in this case, SPR2400 PremGlsy Photo.icc), then click the Save As button in the lower left corner to save this preset. 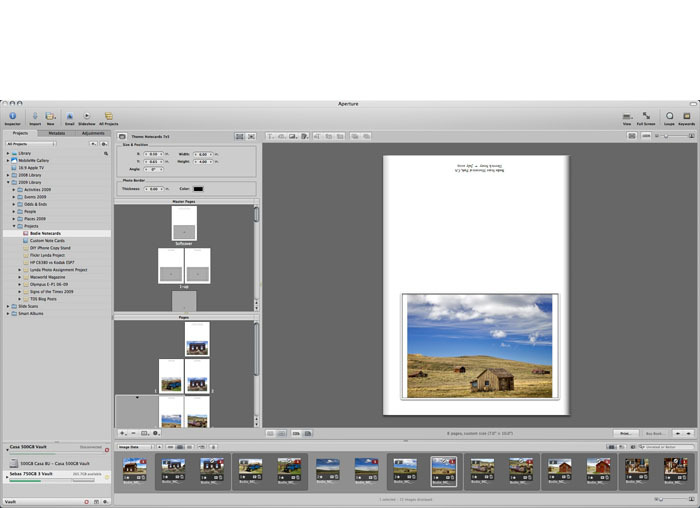 Give the preset a descriptive name, such as "R2400 7x10 Notecard Glossy," click OK, then print. 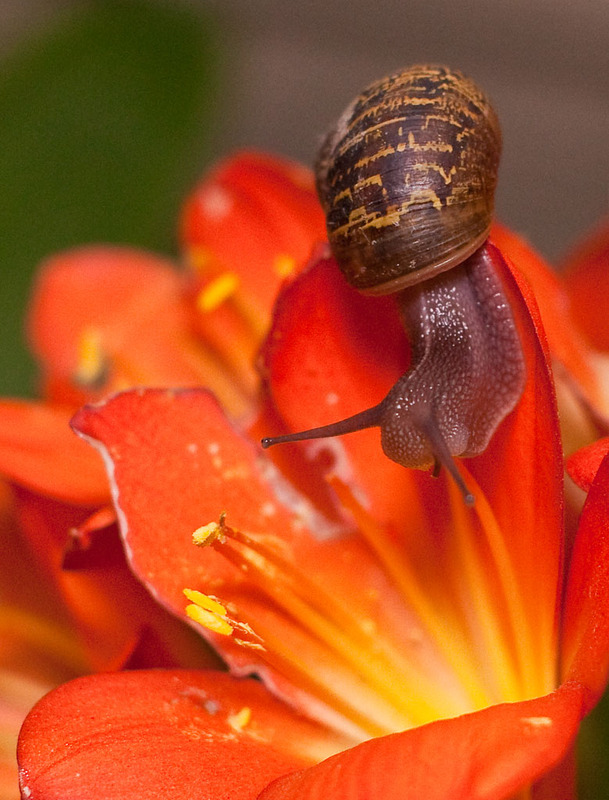 Aperture will remember this preset, and you can use over and over again. You have other options in this dialog box too, such as setting Black Point (which opens up the shadow areas) or increasing gamma (which brightens up midtones). The nice thing about these adjustments is that you can tweak your output without having to mess with the picture itself. If I do make print adjustments, I note those settings in the description area of the photo so I can use them again next time. To print matte surfaced cards, I swap out the black cartridges in the R2400, then create a new preset in the Aperture Print dialog box that uses the Enhanced Matte Paper ICC profile. I then load up a sheet of Premium Matte C2S and make a test print. If I'm not satisfied with the initial output, such as the shadow areas rendering just a little too dark, I make a "New Version from Version" by right-clicking on the image. Now I can adjust the image for the matte surface and try another print. Since all of my print settings are saved as presets, and my card layouts are saved as templates, I can come back to this project when ever I want to print additional cards. If you use Aperture's Vault, it will save your settings to a backup drive. Once all the printing was done, it was fun to spread out the cards and choose my favorites. Some images looked better with the glossy surface while others were really nice on matte. I carefully folded the cards along the score, then bundled each one with its matching envelope. I even found 5" x 7" cardboard boxes at the craft store that I could use for packaging sets of notecards. Obviously there are variations to just about every step in this process. You can use other photo applications or printers. The tools I chose were the result of testing, with these being the easiest and most efficient. And I have to say, now that the project is over, making custom notecards from my own pictures is very satisfying.